A curated list of awesome programming, development and similar technical support or discussion channels, groups, communities, resources and other shiny things. Looking for more lists like this? Some important websites where cool developers hang out and give back to the community. Hacker News - Latest and in-depth technical news about hacking, technology, security, cyber, vulnerabilities, privacy and similar technical discussions. Quora - Quora is a question-and-answer website where questions are asked, answered, edited and organized by its community. Reddit - Reddit is an entertainment, social networking, and news website with lots of forums for developers. Sitepoint Forums - Sitepoint community forums for developers. Slack - Platform for team communication: everything in one place, instantly searchable and available. Changelog Developer Community - Changelog is news and podcasts for developers. Join the community Slack for great discussions. Communities organized by programming/scripting/markup language interest. Assembly programming language related community. PHP dynamic scripting language related community. PHP Chat - A community of PHP Programmers from around the world, on Slack. PHP-UG - An international meeting-point for the PHP-Community. Community organized by CakePHP framework interes. Slack - Symfony group on Slack, platform for team communication. rust - Official room for rust lang. Notable groups, communities and clubs of miscellaneous context types. OpenSourceDesign.net - A community of designers and developers pushing more open design processes and improving the user experience and interface design of open source software. Some learning material for building community and what members and leaders of the best communities read and adopt. 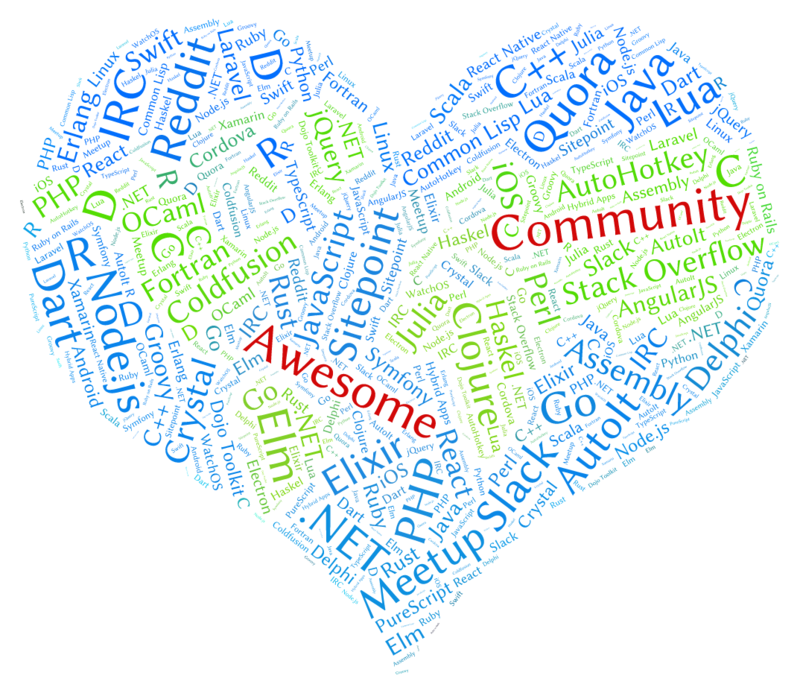 Awesome articles and blog posts about community, user groups, community management etc. 5 Ingredients for Building Community - article, how a community of over 100 top designers including founders, leads and angels has been built. In-depth reading material about community. Various types of resources - guides, videos and similar best practices. Hackr.io - A curated resource of programming courses, tutorials, and communities. Interview with Cal Evans - The undeniable icon of the PHP community. awesome-answers - List of inspiring and thoughtful answers given at stackoverflow, quora, etc. awesome-slack - List of communities about web development and design that are powered by Slack. You are most welcome to contribute to this Awesome Community list as well. Big thanks to all current contributors who have helped build this Awesome Community list.